Mike Moore and Jeff Lees graduated from the Certificate IV in Ceramics at the Nepean Arts and Design Centre in 2007. Since they completed their study with us, they have followed their careers in ceramics with a passion. After completing further study (Diploma of Ceramics at SWI) in 2009, Jeff and Mike started running pottery classes for HIV positive people. The classes, called "Positive Pottery" are held at Pine Street Creative Arts Centre in Chippendale, and are supported by a generous grant from the City of Sydney. 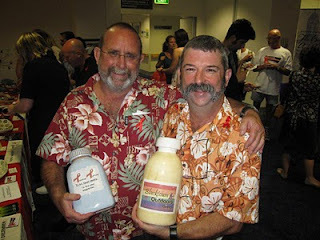 On Friday the 26th of November 2010, Jeff and Mike's students held an exhibition called "HIVitrification" at St Vincent's hospital in Paddington.
" It was amazing; a fair amount of their work sold on the night. We even had Margaret Olley come along and purchase a piece from one of our guys." said Mike. In 2011 Mike and Jeff will undertake a Graduate Diploma in Visual Arts, Ceramics, at the Australian National University in Canberra. As part of their coursework, they will travel to China on a study tour, including a three week intensive residency in a porcelain factory, which also hosts an artist's residency and experimental design centre. Mike say his Mandarin is "lousy". "Seeing as it is only women who put up translations on the net, I have been told by my travel agent I pronounce words like a girl" he laughed. Mike and Jeff have numerous plans for networking whilst in China, and are investigating ongoing forms of cultural and professional exchange. Both ceramic artists gained a great start to their career from their training at Nepean Arts and Design Centre. "I certainly would like to say how much Jeff & I learnt at Nepean; due to the professional staff; whether teaching or ancillary staff, as well as the professional facilities that NADC has to offer", said Mike. Congratulations to our two graduates for their ongoing professional activities in their field. For more information on studying ceramics at The Nepean Arts and Design Centre, click here. 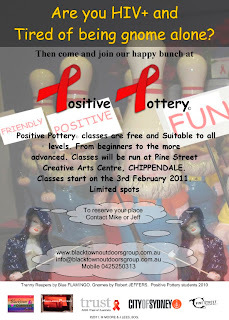 Flyer for Mike and Jeff's 2011 Positive Pottery program. Click for larger image.